Shoreditch, London, 1963. The Beatles have beaten John Smith and the Common Men to No. 1. Satellites are being launched into outer space whilst on Earth a master thief is stealing some highly specialised equipment. In the streets and bombsites around Totter's Lane, the normally placid teenagers of Coal Hill are running riot: searching out the different and hunting down the alien. 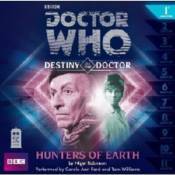 Schoolgirl Susan Foreman just wants an easy life for herself and her grandfather, the mysterious Doctor. She wants to be liked and accepted by Cedric and all the other pupils at Coal Hill School. But Susan has been inadvertently drawing attention to herself. The hunt is on - and Susan and her grandfather are the quarry. Celebrating 50 years of Doctor Who, this is a brand new adventure for the First Doctor. Carole Ann Ford - Susan in the original BBC TV series - and Tam Williams perform this original story by Nigel Robinson, with music and sound design.